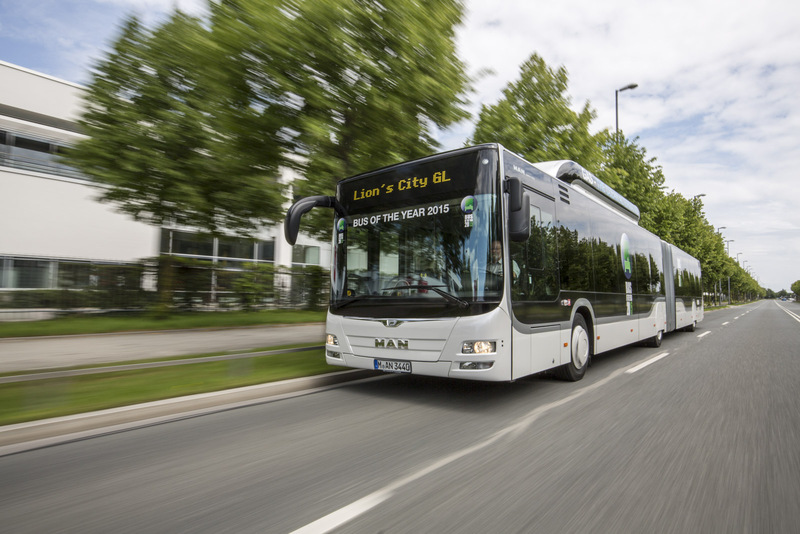 Clean, powerful and economical: these are the characteristics of the MAN Lion's City GL CNG which wowed the panel of trade journalists from across Europe judging this year's 'Bus Euro Test'. The 18.75 metre long natural gas-powered articulated bus cruised past the competition at full throttle in order to claim its place as 'Bus of the Year 2015'. The trophy will be awarded in September at the 2014 incarnation of the IAA Commercial Vehicles Fair in Hanover. The Euro 6 CNG engine of the MAN Lion's City GL CNG offers an environmentally friendly public transport mobility solution with extremely low pollutant levels. When filled up with biogas or e-gas, the articulated bus is virtually carbon neutral; offering emission levels comparable to that of fully electric vehicles. Even without the use of biogas, CO2 emissions are reduced by approximately 17 per cent in comparison to diesel vehicles. As well as being a sustainable fuel source, natural gas is also a particularly economical solution: thanks to the significantly reduced fuel costs, over a period of ten years an MAN Lion's City GL CNG saves approximately 15 per cent on the life cycle costs in comparison to a diesel bus from the same model range. MAN's position as market leader in this sector is backed up by decades of experience with natural gas buses. 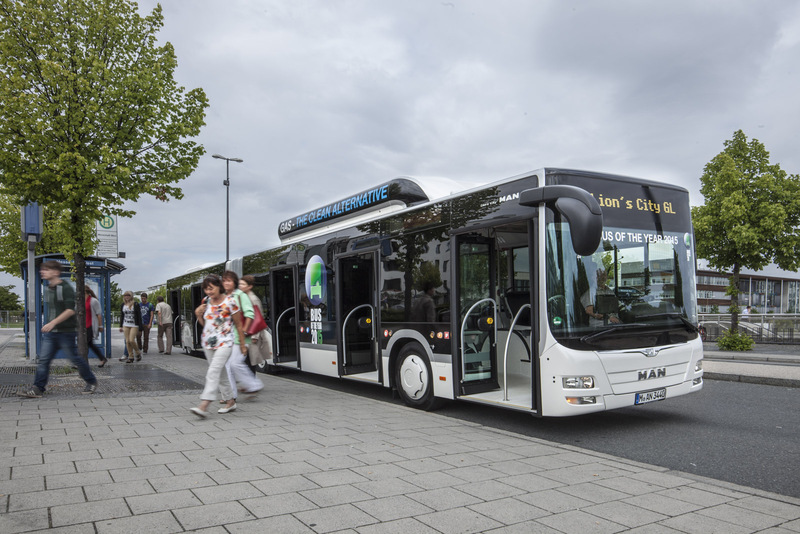 Working in partnership with erdgas mobil GmbH, MAN has taken great strides in increasing the number of natural gas buses in operation, as well as ensuring the continued development of the fuel infrastructure for the entire natural gas mobility industry. MAN not only offers reliable technologies, but is also highly proficient and skilled in the servicing and repair of high-pressure gas systems. If requested by the customer, training courses can be arranged to ensure that MAN's expertise is competently transferred to the customer's own service personnel or an external service team and a global supply of spare parts for natural gas buses is guaranteed. All of this ensures that the operation of MAN vehicles runs smoothly. The Lion's City GL CNG's vehicle concept, designed for inner city routes with particularly high passenger volumes, also played a role in securing the title of 'Bus of the Year 2015'. The 18.75 metre long articulated bus boasts a transport capacity of up to 142 passengers and features five double width doors – making it the only five door bus on the market. Such innovations ensure optimal passenger flow and reduced waiting time at stops. The vehicle is also fitted with three fold-out chairs which the driver can control, meaning more standing room can be made available in the event of a large influx of passengers. The ticket validation machines are capable of scanning electronic tickets purchased by smartphone, the bus offers passengers internet access via a free Wi-Fi hotspot and its screens are individually programmable. Passengers are bowled over by the interior's top-quality materials and innovative lighting: the translucent bellows, glass sunroofs and LED light strips (using energy-saving diodes) combine to give the interior an energy efficient, uniform and pleasant atmosphere. The LED lighting allows the power consumption to be reduced, which in turn means less generator capacity is required. Headlights equipped with LED daytime driving lights and rear lights employing the same technology make additional contributions to energy saving.